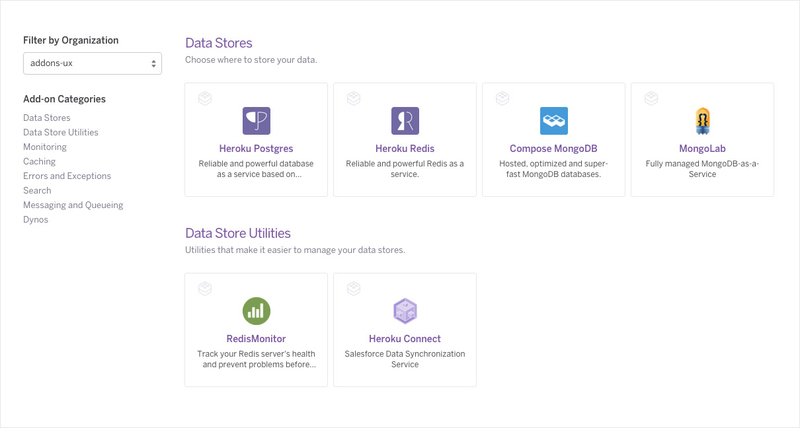 Today we are introducing Add-on Controls for Heroku Enterprise customers. This new feature enables team leads to whitelist specific add-ons for approved use within their organization, choosing from our marketplace of over 150 add-on services. The ability to standardize the add-on technologies being used across all the apps and developers in their organization is something many customers have asked for, especially those with fast-growing teams. 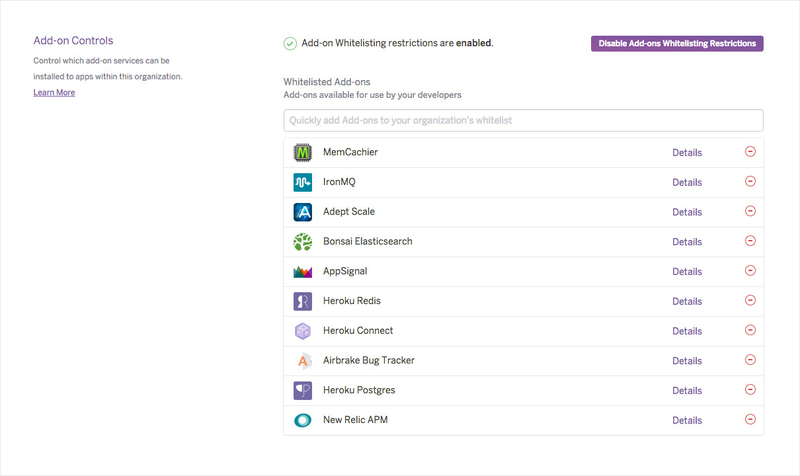 To get started with Add-on Controls, the first step is for the team lead, or anyone who has admin permissions, to build the Add-ons Whitelist. There is a new section on the organization’s settings page, where this whitelist can be created and then the Add-on Controls can be enabled. Don’t worry; enabling the whitelist does not break any existing add-ons, but simply prevents add-ons that are not on the whitelist from being installed going forward. In the Add-on Controls section, you’ll be able to see the add-ons that are currently in use in your organization’s apps, but have not yet been whitelisted (labeled “Whitelist Exceptions.”) For each item in the list, you can click on the detail view to see which apps have installed the add-on and how long it has been in use. Once the feature is enabled, it is easy for team members to view and install the add-ons that are whitelisted for their organization. On the Elements page, the new "Filter by Organization" dropdown lets you see what is available by selecting your organization. This view will be especially helpful when onboarding new developers to the team, as it provides a quick way for them to see which technologies are approved for use in your organization and to hit the ground running. In addition, the Add-ons Whitelist can be kept dynamically up to date as new add-ons become available and are chosen, eliminating the need for email or wiki page updates. Team leads might choose to provide an approved vendor for each category of functionality (logging, messaging, caching and so on), narrowing down the many choices currently available in each category. Add-ons which are not whitelisted for use are marked as restricted and cannot be installed. Note that add-ons will still be installable to personal apps that a team member owns that are not part of the organization. You can learn more about Add-on Controls in the Dev Center. As always, we welcome any feedback you have on this new feature. 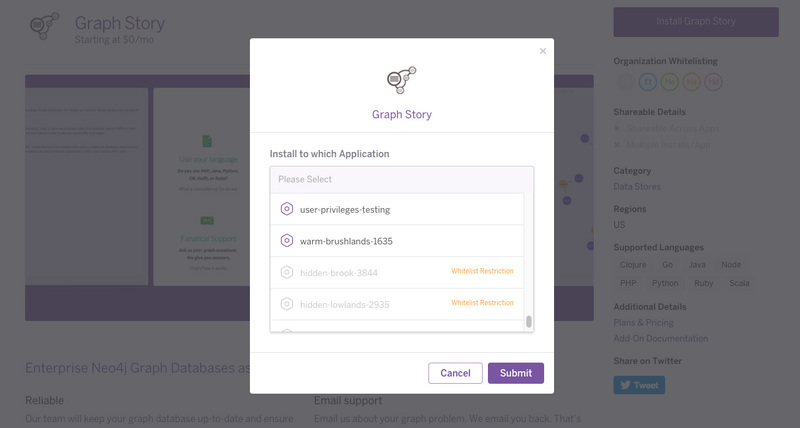 Please reach out to us at addons-feedback@heroku.com or contact us via through support.